Doors & shade systems are the most wanted of PVC strip curtains supplier in UAE for all warehouses, cold stores, restaurants, offices, schools, pantry units. 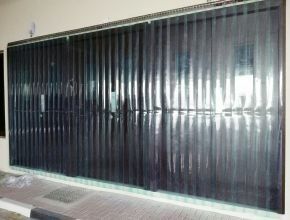 These curtains are installed in cold stores, warehouses, restaurants, clinics, schools, hospitals, supermarkets e.t.c. These curtains act as a barrier to control the internal temperature, insects, dust e.t.c. Wide varieties such as polar, anti-insect, anti-static, anti-dust & many more. All these pvc strips are installed on stainless steel tracks with stainless steel clips.